LOS ANGELES - Feb. 6, 2019 - PRLog -- Four years after the release of his debut novel (American Fraulein), author Samuel Piazza has released his sophomore effort, an action-oriented mystery thriller, The Blue Regina. Like his first book, this new historical-fiction novel finds its setting in the shadow of World War II. The story's genesis stems from the historical phenomenon of Nazi plunder. From 1939 until the end of World War II, agents of Hitler's Nazi Party confiscated works of art, gold, jewels, and other cultural artifacts from countries under Nazi occupation. Untold amounts of treasure were, as the author shares in the introduction, "discreetly hidden in mountain crevices, caves, and underwater vaults and secret burial sites." 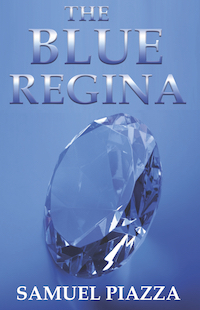 At the heart and title of the novel is a fictional 47.05 carat blue diamond known as the Blue Regina. Confiscated from the Netherlands, and then proudly displayed in Berlin, the diamond was accidentally transported to the United States in 1941. Shortly thereafter, Germany declared war against the U.S., and the diamond's whereabouts remained unknown throughout the war and beyond. In 1951, a noted Berlin gemologist initiates a U.S. bound expedition to recover the Blue Regina. News of the mission spreads, motivating others to seek the diamond for their own ends. The suspense and action of the race to find and capture the Blue Regina, along with the author's revelation of the various motivations and mindsets of a diverse cast of characters, keeps readers turning the pages. As the story unfolds, the hunt morphs into a no-holds-barred, life and death struggle to gain control of the 47.05 carat blue diamond. "Even today, we occasionally come across news stories detailing the discovery of confiscated treasures from World War II," says Piazza. "The Blue Regina is a fun read and was written first and foremost to thrill and entertain readers. At the same time, I hope that as confiscated treasures continue to be discovered in the real world, the historical context of the novel will keep us ever mindful of the tragic human cost paid by the original owners of such artifacts." The Blue Regina is published in eBook format by eBookIt.com and is now available at popular online retailers including Amazon.com, Barnesandnoble.com and Apple's iBookstore. The release of the paperback is anticipated later this month. Samuel Piazza is a retired lieutenant with the Los Angeles Police Department, and former educator. He served in Bosnia-Herzegovina as a Station Commander for the United Nations International Police Task Force, and is a recipient of the United Nations In Service of Peace Medal. Since 2010, eBookIt.com has helped thousands of authors and publishers get their books converted to ebook format, and distributed to all the major ebook retailers.